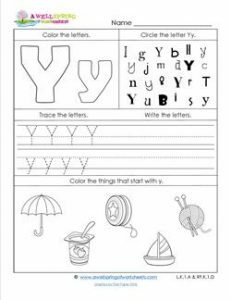 It’s abc worksheet time! And here is the letter Y. It’s ready for you to share it with your students so they can become even more proficient with identifying and writing the letter y. Take a look at the objects at the bottom of the page. Kids get to sound out the names of these objects and decide which ones start with y. Then they get to color them. The objects that don’t start with y should not be colored. Kids can also write the letter y, search for the letter y, and color the letter y.